The StrExplorer to browse and manage tens of thousands of structures. The placement of these structures. This tutorial will explain the core feature StrExplorer and its functions. With its two main features, the StrExplorer is like a combination of Google and Spotify. It’s like Google because it offers a powerful search engine that searches tens of thousands of structures for a variety of criteria. For example, you can search for structures, collections, and builders, then sort and restrict the results, popularity, size, and so on. And it’s like Spotify, because it stores structures with extra information in your library so you can manage and place them. Here are your stored structures, collections and creators as well as external and self-created structures are displayed. Furthermore, the StrExplorer offers a number of additional features such as views for interacting with the Minecraft world. Thus, you can place or reposition structures via a graphical user interface. The Instant Structures Mod (ISM) workflow requires you to search for structures, find, store in your library, and place it from now on. 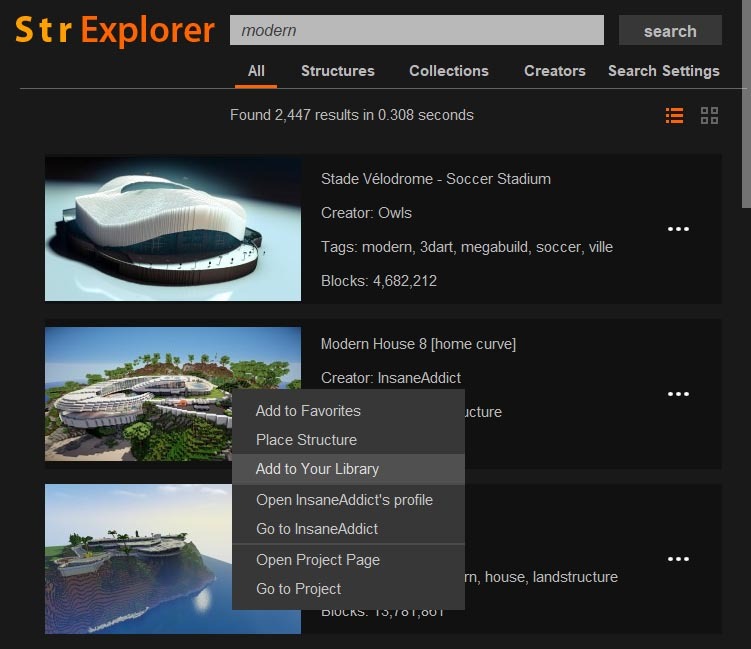 As mentioned before, you can search Minecraft structures and collections as well as their creators. You can do this by using the search bar in the browse view or in the upper right corner of the StrExplorer. Let’s just search for the keyword “modern”. Now you will see the search results either in a detailed view with first additional information or in a minimized view. With a right-click on a result, you can open the context menu, which allows you to retrieve additional functions for the search result, such as saving in your library or placing. In this view, all types of search results appear mixed, that is, structures, collections and builders. Here, the StrExplorer displays all suitable structures. The same applies to found collections. They are characterized by being projects that contain multiple structures. These structures are usually very similar in style or are variations of each other. Here, builders are displayed that match the search term. With the search settings, you can further narrow your search and specify it. You can filter out certain search results. So, you can determine whether the search term in the title, the URL or the tags of the project should be searched. Found Minecraft structures can still be filtered by their size and number of blocks. For example, you can only view small or extremely large structures and collections. 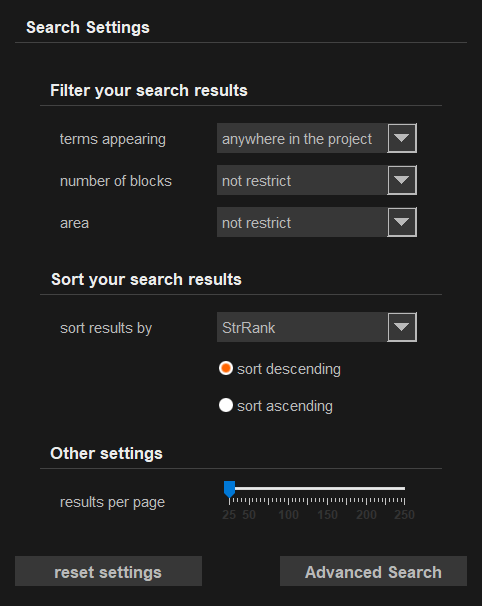 With the StrExplorer you can sort already filtered search results.By default, StrExplorer sorts results by StrRank. This search index considers various criteria such as popularity, construction, and size of a structure to show you the most relevant results and most beautiful structures first. You can also sort the results by many other criteria: number of blocks, downloads, views, date of creation, and so on in ascending and descending order. The StrExplorer has detailed views of the various search results. In these you will see a series of pictures and further information as well as links to the project itself and to the builder. From here you can view other structures of the builder or search for their tags. 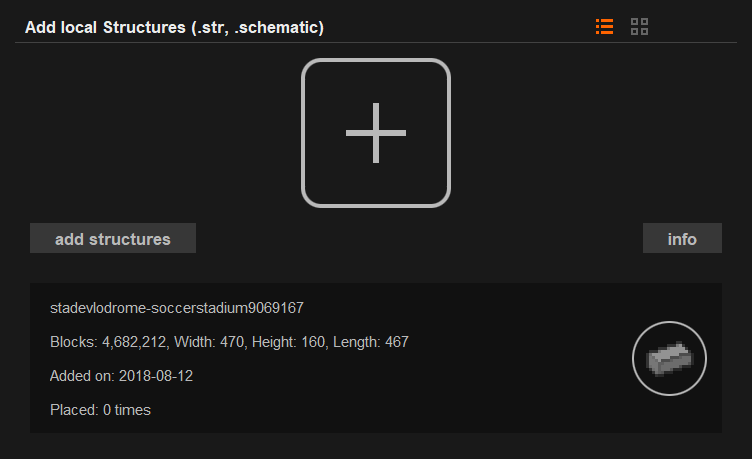 With the round buttons you can place the structure, save it in your library and favor it. If you are in the detail view of a collection, the individual structures are also offered for placement there. Let’s start with the stored structures and collections. Once you add a found structure to your library, it will be downloaded and saved. From now on, this structure will be displayed under the menu item Structures and can be placed. For the download you need an Internet connection, but once the structure is in your library, this is no longer necessary. The same applies to collections and their structures. Under the menu item Creator all builders of the stored structures are listed. In their detailed view you can look at a few statistics about the builder. In addition, all structures of the builder are listed. If a Minecraft structure is not included in ISM, then it can be added externally. This will display your own scanned structures that you have scanned with Instant Structures Mod. If you want to add and place a structure file that is not included in the Instant Structures Mod, you can drag and drop it onto the plus icon or select it via “add structures”. For this, the structure must be stored in the schematic format or str format of ISM. If you have scanned a structure using ISM’s scanning feature, it will be displayed here. This view will show you your last placed structures. ISM provides additional information such as the world in which the structure was placed and the date. If you can remove or reposition the structure, the thumbnail will be displayed in color. Otherwise it will be grayed out. In addition, if you have loaded a world, you can view the structures placed your current world and arrange them to your distance. Here you can mark structures that you like most. These structures will not be saved to your library. These structures will not be saved to your library. You do not need an internet connection to save a found structure here.